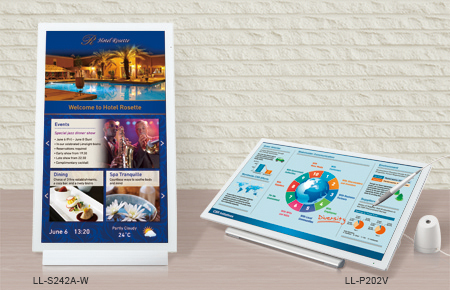 The LL-P202V is a 20-inch-class multi-touch LCD monitor with a digitizer function that lets you write directly on the display with the bundled digitizer pen. This monitor opens up a broad range of possible applications when used in concert with graphics software or with office software such as Microsoft® Word, Excel®, PowerPoint®, and Outlook®. The list of areas where the LL-P202V can add tangible value is almost limitless: in various business situations, in education, for proofreading, for CAD, in hospitality, in healthcare, and much more. 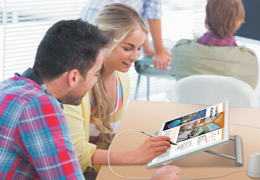 The LL-P202V employs a 20-inch-class capacitive touchcreen LCD with 10-point multi-touch functionality. This LCD provides extremely quick response for writing and touch gestures, while delivering full HD (1,920 × 1,080-pixel) resolution. It can also distinguish between pen input and hand input. When it detects the bundled digitizer pen, it prioritises pen input and cancels any input coming from hands or fingers. The bundled digitizer pen is ergonomically designed for an easy grip and comfortable writing. You can write text or draw illustrations smoothly with an uninterrupted flow, and you can select small onscreen objects and move them around. The pen supports a wide variety of usage situations, ranging from business to graphics applications, using software such as Microsoft Reader. The digitizer pen is pressure sensitive, enabling you to write smoothly and naturally as if on a piece of paper. Signatures look authentic, while illustrations get a warm, organic texture. And the Palm Cancellation function prevents hand input from interfering with pen input, so you can rest your hand comfortably on the screen while writing. 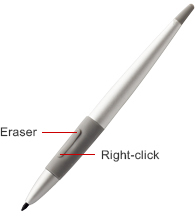 Functions that you need to use frequently, such as eraser and right-click*, can be assigned to a special function button on the pen. Functionality is activated by pressing the button while touching the screen with the pen tip. 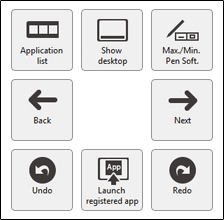 You can also take advantage of an onscreen shortcut launcher comprising eight shortcut icons* for frequently used functions that you can pre-assign. Simply click the function button as you hold the pen hovering over the screen to call up the shortcut launcher. * Function settings can be changed using the bundled utility software. The LL-P202V comes with a stand that can be tilted at an angle ranging from 20 to 75 degrees. 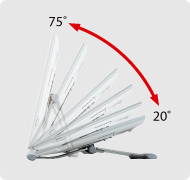 The monitor can be set up in whatever position you find most comfortable: the 20-degree angle is ideal for onscreen handwriting, whereas the 75-degree angle provides optimal viewing. 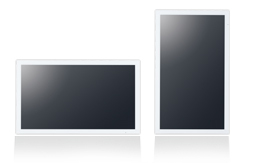 The LL-P202V connects with Sharp’s interactive whiteboards and Sharp video walls for use in meetings, presentations, seminars, and lectures held in large venues. 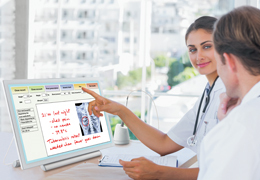 Content on the LL-P202V, including the presenter’s handwritten annotations, can be mirrored in real-time on the interactive whiteboard or video wall for all participants to see. The LL-S242A-W employs a 24-inch capacitive touchcreen LCD that provides extremely quick response for writing and touch gestures, while also delivering full HD (1,920 × 1,080-pixel) resolution. A wide viewing angle of 178 degrees—both horizontally and vertically—means that viewers can see high-quality images with minimal alterations to colour and brightness. A palm cancellation function prioritises pen recognition, so you can write with the touch pen even if your palm is resting on the screen. Whether installed in a landscape or portrait orientation, the LL-S242A-W offers a convenient, high-impact way to convey information in a wide range of settings. It comes with a stand for both landscape and portrait installation, and it offers compatibility with commercially available VESA mounts. The bundled touch pen allows smooth and accurate onscreen writing of fine text and lines—it’s just like writing on paper. The extra-narrow 2 mm tip enables you to easily underline text, add notations, and draw illustrations onto onscreen content. 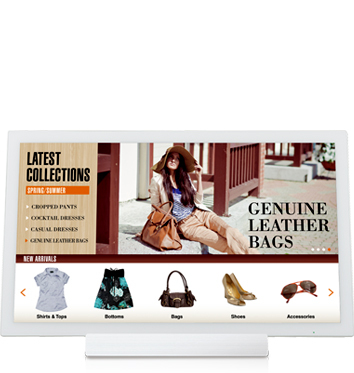 You can also add new information to your digital signage display to keep it up to date, or you can create eye-catching handwritten digital POP displays. The bundled Sharp Pen Software opens up a world of natural handwriting functionality. Once documents have been imported as images and displayed on the touchscreen, you can write directly on them using the touch pen or a finger. This software also features an overlay mode that enables onscreen handwriting regardless of the application being used. 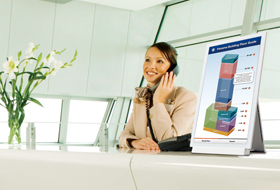 Sharp Digital Signage Software (SDSS) is versatile management software that provides total support for the creation, scheduling, distribution, and display of a wide range of onscreen content. 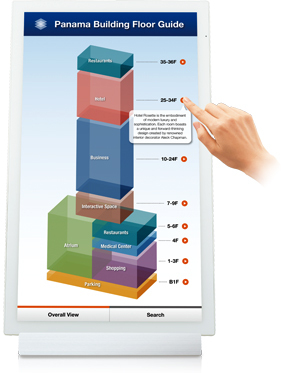 SDSS lets you centrally monitor the system’s operational status and control power on/off.